We’ll start off this week in suburbia. In Lansing, discussion continues for the 102-unit “Cayuga Farms” townhome development, and now we have some more numbers to throw around. 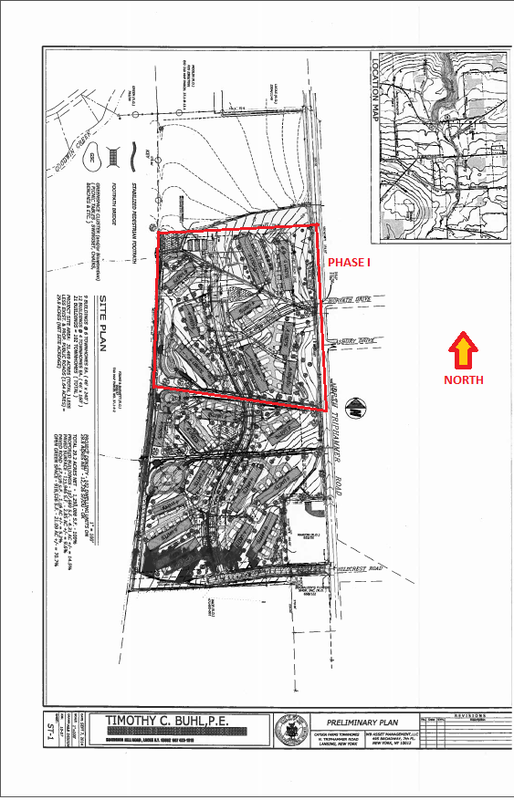 According to the Limited Environmental Assessment Form (LEAF), we’re looking at about 25.2 disturbed acres built out over 4 phases – the first starting as soon as approvals are in hand, and the last due for a completion all the way out in October 2021, partially because the last phase on the south side of the property will be accessed by a proposed public road. The north end gets developed in phase I, with 44 units. Apart from that sizable project, the Lansing town planning board isn’t too busy, with the other discussion item being two duplexes (4 units) on a former mobile home lot. 2. 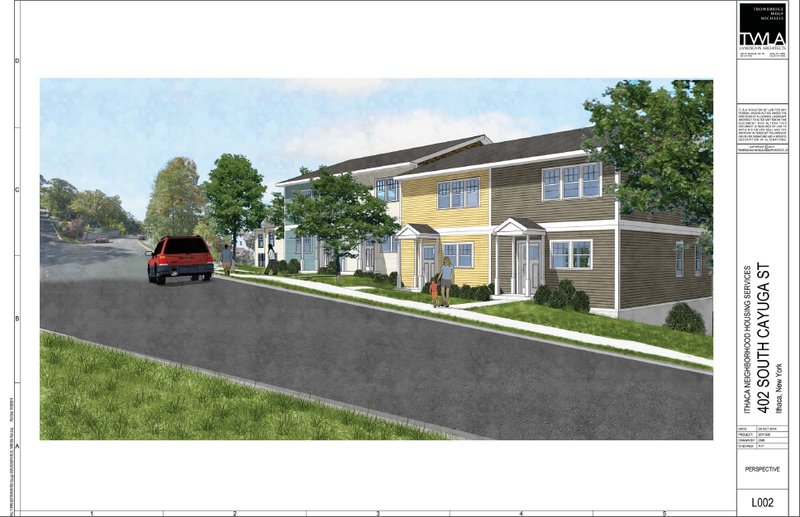 More in housing, this one from the town of Ithaca. 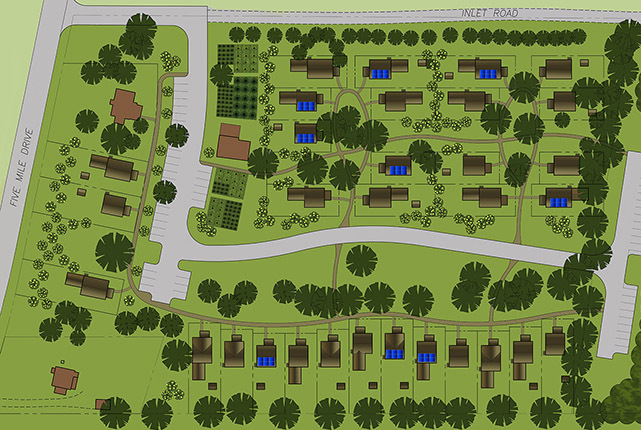 According to its developer (Sue Cosentini of New Earth Living), the 31-unit eco-friendly housing development just southwest of the city-town line will begin formal marketing in summer 2015 at the earliest. It’s also going under a redesign of the site plan, so the above plan won’t be current for long. Just have to wait and see what the revised product looks like. 3. 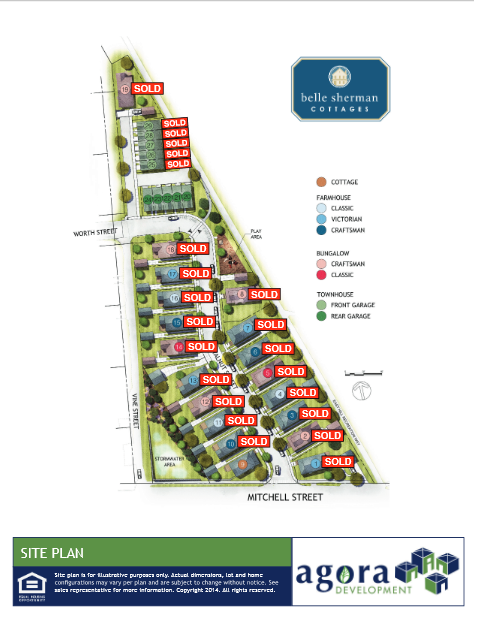 Sales have been robust with the Belle Sherman Cottages townhomes – two more sold between the 17th and 27th. That’s pretty darn impressive for a housing development in upstate. One of the last houses sold as well, leaving just one home lot, the yet-to-be-released new cottage design. If sales for the first set of 5 townhomes went that fast, I imagine that when marketing for the other 5 begin, they’ll be sold out within weeks. 4. 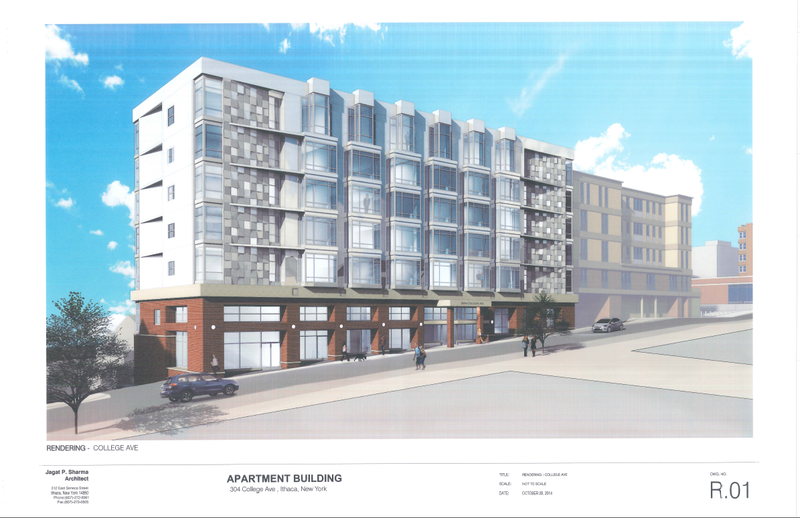 New renders for INHS’s at 402 South Cayuga Street. 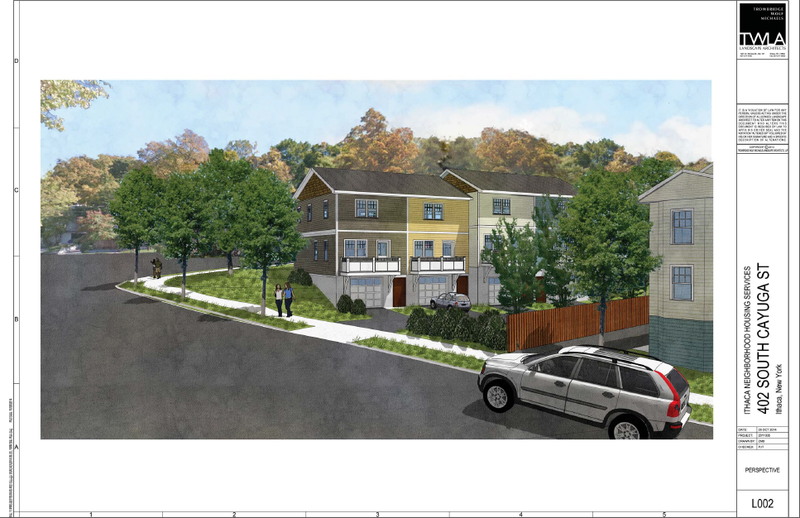 Still 4 townhomes, but the design from local firm TWLA (Trowbridge Wolf) is completely new. Affordable housing is always welcome on a vacant lot near downtown. But I like the previous design better. If I remember right, they are 2 bedroom units, and set for a fall 2015 completion. 5. Last but certainly not least – a few more details about the two-part 304 College Avenue project, first shown yesterday. The Sun was kind enough to do some legwork and reach out to the real estate company, and for that effort we now know that the Avramises are shooting for a June 2016-August 2017 construction period for the 6-story building at 304 College. The Catherine Street structure may be built concurrently, but that is yet undecided. Like many of the new buildings, it’s intended to be focusing on the high end of the rental market, although it’s too early to specify actual rent prices. It includes a small amount of parking, which I’m sure will cost a mint. Declaration of lead agency is expected in early 2015 with approval some time in the spring, if past experience is any indicator. It may seem unusual to propose such a far-flung construction date, but I suspect it has everything to do with costs and logistics. 114 Catherine and its 17 beds will be underway in the first half of 2015, and by summer 2015, 205 Dryden (Dryden South, 40 bedrooms), 307 College (Collegetown Crossing, 96 bedrooms), and 327 Eddy (64 bedrooms) will be underway. Labor will be at a premium, and since they’re within a couple of blocks of either, materials movement is going to be complicated. The Avramises may be hoping to start as other projects finish up, logistics improve and labor frees itself up. Problem is, Collegetown Terrace phase III starts in late 2015 and will run through 2017, so the construction labor market is going to be well-tapped regardless of whether they start in 2015 or 2016. On the plans for the project, page 2.01 (typical floor plans) seem to have the labels wrong for first floor and typical floors. (I know, I nitpick too much). Secondly, I wonder about the size of the underground parking for the building, and why that isn’t done more in C-town. I’m guessing it must be cost prohibitive or too difficult due to soil conditions. btw, I liked the old 402 Cayuga plans better myself. Looking at Page 1.02, I was under the impression there were about 29 parking spaces for both buildings total, so about 1 space per 7 bedrooms. Underground parking is extremely costly to build, so it takes a very lucrative project to justify it, and since zoning in Collegetown limits project size, subterranean parking is not typically worth the cost. 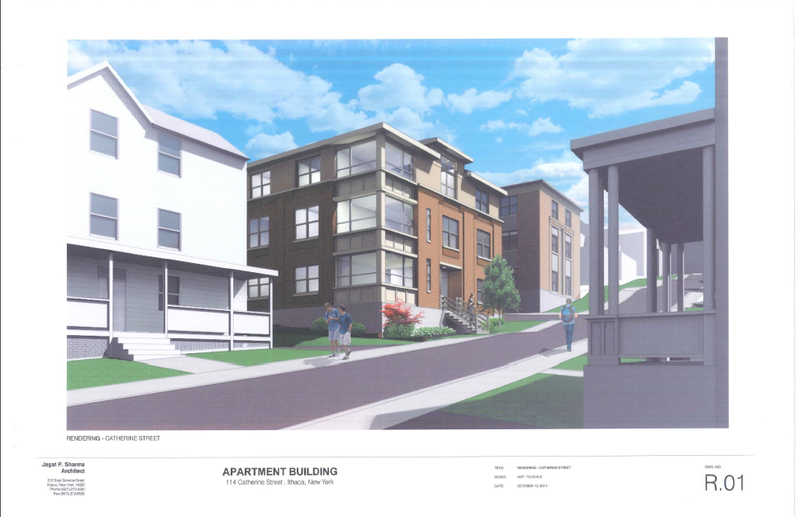 Good god I wish there were some way Ithaca could comprehensively incentivize the replacement of its collapsing wooden housing stock with apartment buildings like 304 College outside of Collegetown. The demand is certainly there, but probably not the price point to justify demolition and new construction. Just think of the supply that could be added and the acres of countryside in places like Lansing being scarred by slapdash suburban construction that could be saved by housing more people who want to live in the city itself (as evidenced by the crazy rapid sales of the Belle Sherman cottages). Replacing the rotten old houses in Ithaca should be among the highest priorities in my opinion. Glad to know I’m not alone considering them detestable. Land in Ithaca is very expensive, but it hasn’t reached the point where teardowns are economically feasible. When the price of a replacement house is about 3X the price of a potential teardown property, including demo costs — for example, you’re building a $400K house on a developed lot bought for $120K, and demo costs are $10K — the numbers start to work. A small part of the problem is that there’s a good-sized market of homebuyers in the area who actually like and desire the city’s “funky”, “quirky”, “character-filled” houses. Many really don’t seem to mind deficiencies that, anywhere else, would render a house functionally obsolete and shunned by homebuyers. Low ceilings, odd floor plans, no closets, and refrigerators in mudrooms? That’s “charm”, not a dealbreaker. As long as people are lining up to drop $200K and more for time-beaten folk Victorians and Greek Revivals, they’re not going anywhere. Another issue: taxes. Many homes aren’t updated, much less maintained, because any improvement would be rewarded by a spike in the owner’s already high property taxes. It’s a perverse disincentive, of sorts. It sounds like that weird tax disincentive might be something that could easily be fixed, at least. I don’t mind or care that these houses have weird layouts inside (although it’d be nice to have more housing that isn’t so deficient to choose from myself), I care that they look like they’re falling apart when I walk past them. It makes visitors wince and me embarrassed for Ithaca, which actually has the economic capacity to look more spruced up than Bridgeport or Newark. IMHO, changing that is going to involve a cultural shift that could take a generation or more. Ithaca has more than its share of hippies and countercultural types, and they generally romanticize a “rustic” built environment. There’s also a lot of pride in rejecting middle-class norms, which includes “obsessing” over neat lawns, gardens, driveways, paint jobs, and so on. Consider the conditions at relatively new cohousing projects. Ecovillage looks a bit run down and weatherbeaten, and its residents are affluent and well-educated. White Hawk has a very rough and unmaintained appearance by design, like the aim is to recreate conditions in a West Virginia holler. The city seems to enable the “make our houses at one with Gaia” crowd with lenient property maintenance laws (http://ecode360.com/8389161#8389161), and lax enforcement in residential areas. If the city proposed stricter property enforcement laws, my guess is that there would be far more opposition than support. Defense of the status quo? “Grit” and “funkiness” as a part of Ithaca’s character and identity, property maintenance would increase “wasteful” resource and energy consumption, and the city’s poorer residents can’t afford it. I think the worst offenders aren’t the hippie homes but the collapsing, slumlord-owned student apartment houses on East Hill. IMO, it’s a shame the Collegetown zoning changes didn’t cover a wider area to incentivize plowing down each one of them (the East State St hill, for example, continues to be a very undignified entryway to downtown, and Stewart Ave. is hardly much better).